Since I'm a KDE Connect Indicator user myself, I couldn't say no, so I created a new KDE Connect Indicator PPA, which provides packages for Ubuntu 17.04, 16.10 and 16.04 / Linux Mint 18.x. I didn't upload packages for Ubuntu 14.04 / Linux Mint 17.x because I couldn't build the latest KDE Connect for this Ubuntu version due to newer dependencies, and Ubuntu 14.04 has a pretty old KDE Connect version. The KDE Connect Indicator (fork) developer is also looking for someone that can create and maintain Flatpack and Snap packages. If you can help, see THIS bug report. 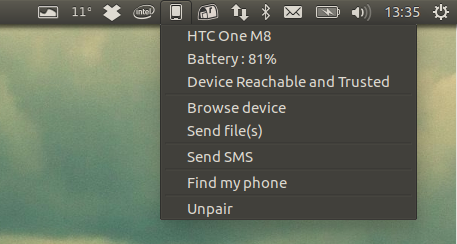 In case you're not familiar with KDE Connect Indicator, this is an indicator / tray for KDE Connect. Using KDE Connect, you can mirror Android notifications on the desktop, easily send and receive files from an Android device to your desktop (and the other way around), control desktop media players from Android, share the clipboard between your Android device and desktop, and more. Check out our KDE Connect Indicator fork article for more information. As a reminder, KDE Connect depends on quite a few KDE packages. You may want to save the KDE package list that's installed to make it easier to remove in the future, in case you want to remove them ("apt autoremove" won't remove all of them, at least in Ubuntu). You can also download the latest KDE Connect Indicator deb from GitHub, but you won't receive updates through your system's update manager. For Ubuntu 16.04 and 16.10 / Linux Mint 18, you'll also need a newer KDE Connect version for the indicator to work. KDE Connect 1.0.3 is available for Ubuntu 16.04 / Linux Mint 18 and Ubuntu 16.10 in the PPA.